We are so excited to be working with your amazing 5th and 6th grade students on 4-H Project Achievement! So far this month, we have had over 200 young people present a speech/demonstration within their classes during our 4-H meetings! (Keep an eye out on our Facebook page for those photos.) 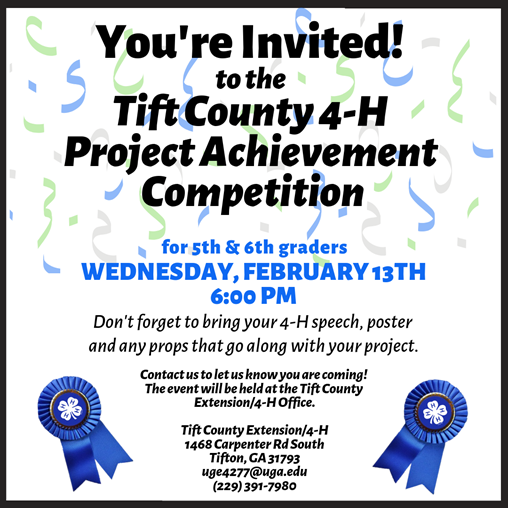 When we came for presentations, we gave students their official invitations to our County 4-H Project Achievement Contest that will be held this Wednesday, February 13that 6:00 PM. In order to get an accurate count for judges, ribbons and refreshments, we need your help! 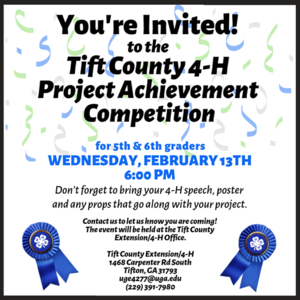 Will you please remind all 5th and 6th grade teachers and students that if they want to come compete this Wednesday with their 4-H projects, they need to have their parents call to RSVP by TODAY. Parents may also call to ask questions. We are happy to help! Please remind and encourage your students to compete in this awesome opportunity. They will need their speech and a poster, but they may also bring props if they would like to. Thank you for supporting them with their projects over the last couple of months. There is no way we could do this without you! J Please let me know if you have any questions.